This is the all-mountain bike we’ve been waiting for Cannondale to build. 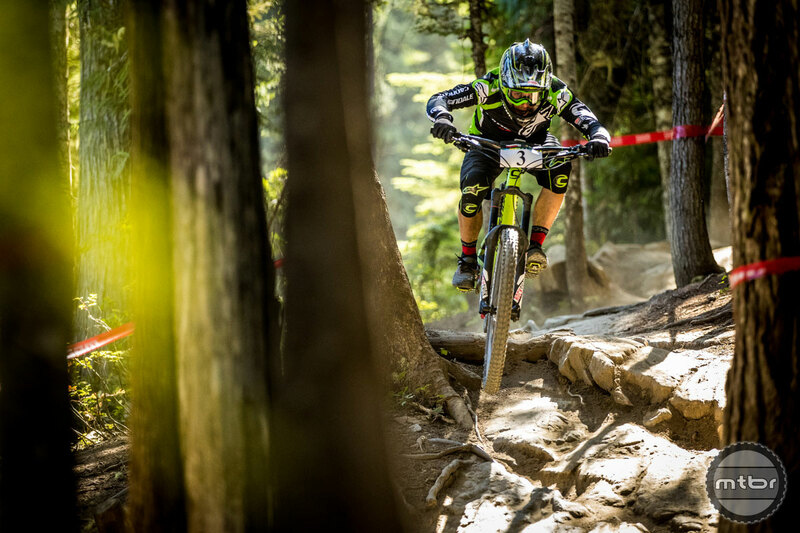 Cannondale has always marched to their own beat, building the bikes that they want. This has created a legacy of unique bikes and ground-breaking technology, and has gained them a loyal fan base that would purchase their products above all else and recite the stiffness to weight advantage of the Lefty fork above any challenger. But it has also limited their customer base and made engineering very expensive, as they’ve had to pave their own R&D trail. 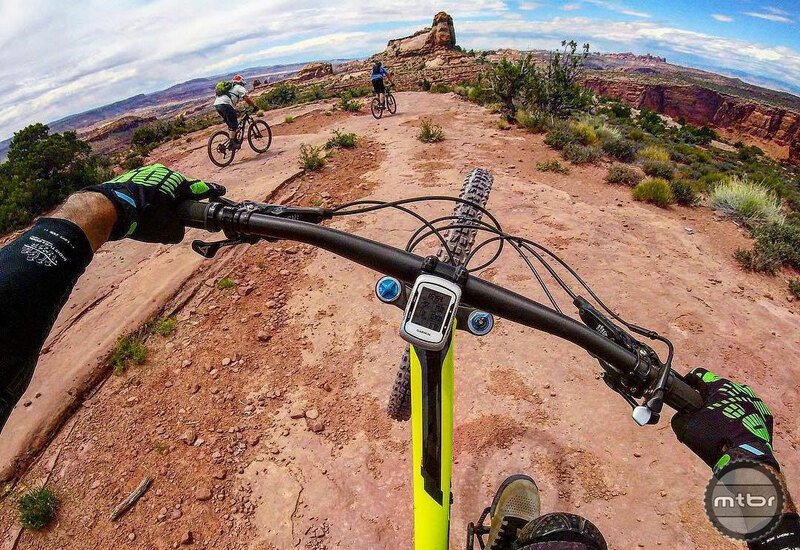 Well, a switch seems to have flipped, as they are now attacking the market with more mainstream offerings to address what all mountain riders want to buy. But they’re still putting their own unique Cannondale twist here and there where they feel it offers an advantage. 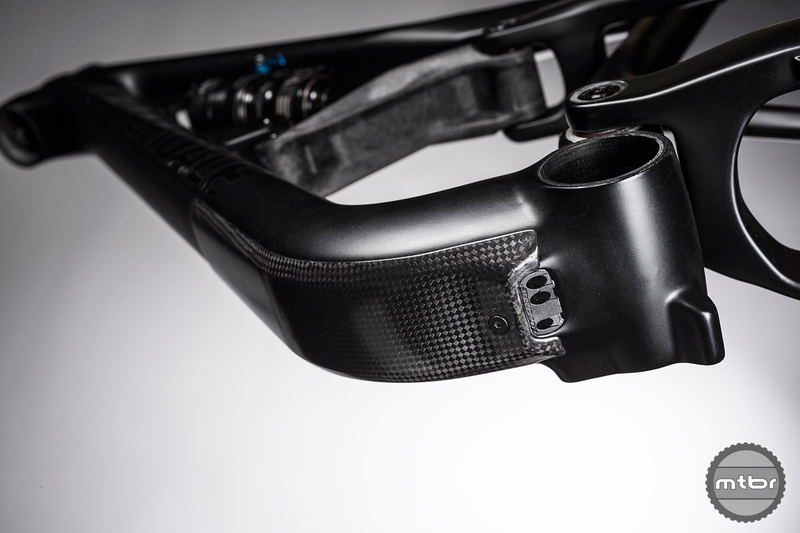 Fans will admire the Jekyll’s full carbon downtube protector. What they’ve come up with is a 27.5 enduro bike with Fox front and rear suspension and 170mm front and 165mm of rear travel. It’s slack with a 65-degree head angle, and pedal ready with a 75-degree seat tube angle. Reach is long, chainstays are short, and it’s shipped with a wide bar and stubby stem. Other spec highlights include SRAM Eagle 1×12, Maxxis Minion tires, Fabric saddle, and a Race Face dropper. And that build sells for a hair under $6000. There’s also a $7750 model with carbon wheels, plus $4200 and $3200 builds. Travel was just right for this rocky terrain. Riding was fun and easy down a burly trail like Porcupine Rim. The component spec for this under $6000 build is something to be marveled at since it reads like a dream spec detailed on a custom build spreadsheet by some bike nerd. It starts with SRAM Eagle XO with a 30t chainring for climbing any hill. Stoppers are SRAM Guide RSC. Tires are 2.5 and 2.4 Maxxis Minions. The saddle is our new favorite, the Fabric Scoops. 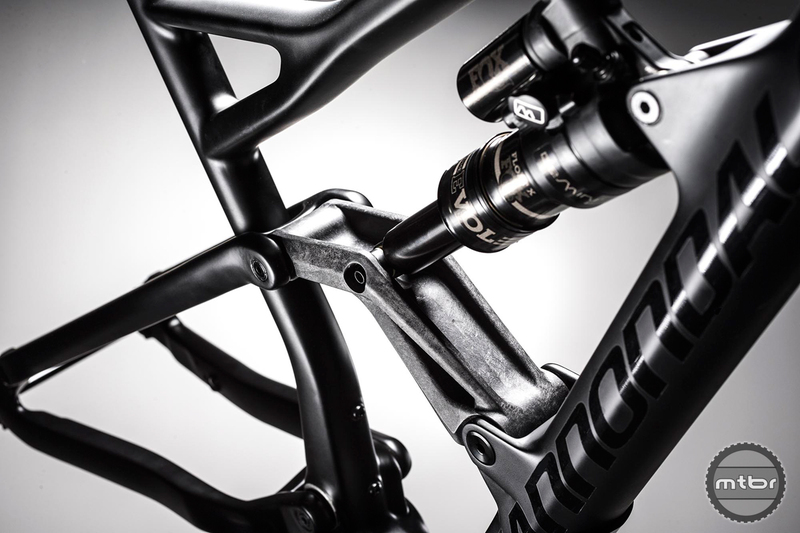 And dropper post duties are handled by a 150mm Race Face Turbine with dialed under-bar dropper lever. Unlike most bikes with a rubber protector, this one is woven carbon. 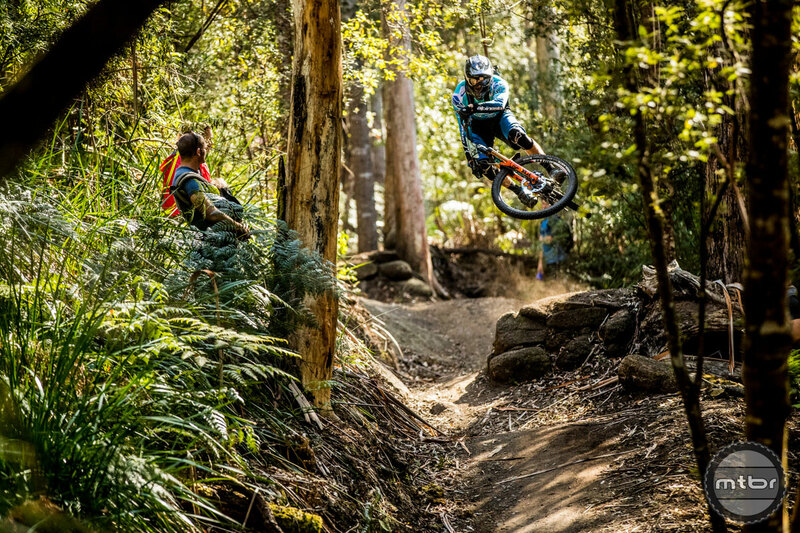 Geometry was dialed in with the help of Cannondale pro riders Marco Osborne, Jerome Clementz and Mark Weir. Travel is 170mm front, 165mm rear, which is ahead of the curve especially when this bike was announced last year. They were looking two years ahead in the design process, and it’s quite visionary. Head angle is 65 degrees, and seat tube angle is 75. Simple, basic, perfect. Reach is 448mm for a medium with a 420mm chain stay. And while a BB height of 13.7” may not seem all that low, it is for Cannondale and this class of bike. 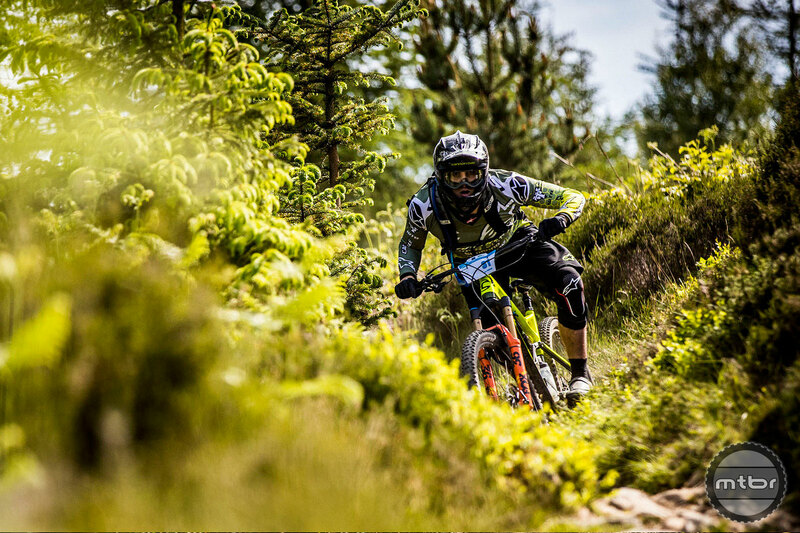 There’s 165mm of rear travel to account for and a lot of Enduro World Series courses out there that can simply be described as chunky. The huge rear linkage makes kinematics possible while still leaving room for a water bottle. Of course, Cannondale has to put their stamp on this bike to make it their own. The two most notable features are the Hustle/Flow rear shock and the rear wheel offset. The Hustle/Flow rear shock switch is technology proprietary to Cannondale/Fox where they allow the rider to switch between 165mm rear travel and 130mm with a remote switch. This allows the rider to switch down to a fully active 130mm rear travel mode that is more climb and flow trail friendly. 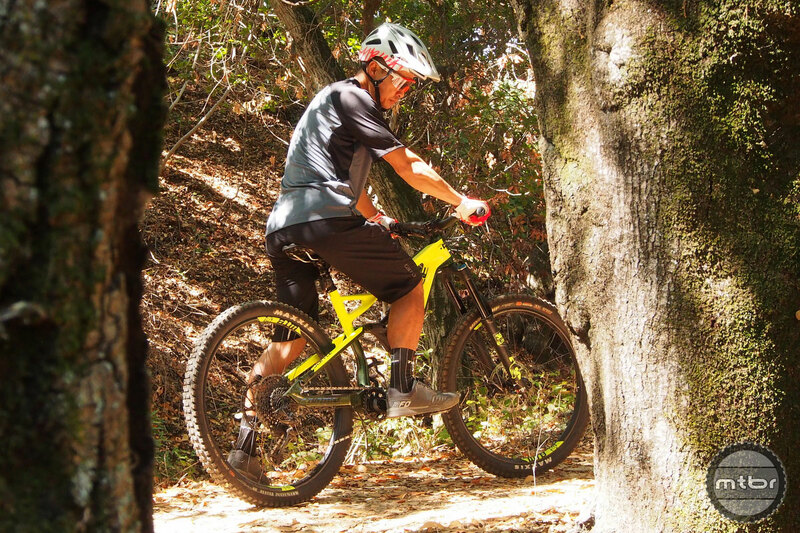 But it’s designed to still be fully active unlike many trail modes of previous shocks that suffocate the shock and restrict responsiveness to bumps. The other technology employed is Cannondale’s asymmetric integration rear hub spacing. It starts out as a 148 boost hub, but they offset the rear triangle 3mm towards the drive side where more room is needed. This increases wheel stiffness, allows for shorter stays, and maximizes tire clearance. You can flip to 130mm rear travel and climb. The bike climbs well for what is a 31-pound long travel, slack bike. It pedals well with a seating position that is extremely comfortable. The 75-degree seat angle really proves its worth, putting the rider forward in the efficient power transfer position and tucking out of the way on descents with the 150mm dropper post. When the long climbs came, we flipped the rear travel to 130mm, and were off to the races. It helped and it wasn’t harsh like most trail modes on common rear shocks. 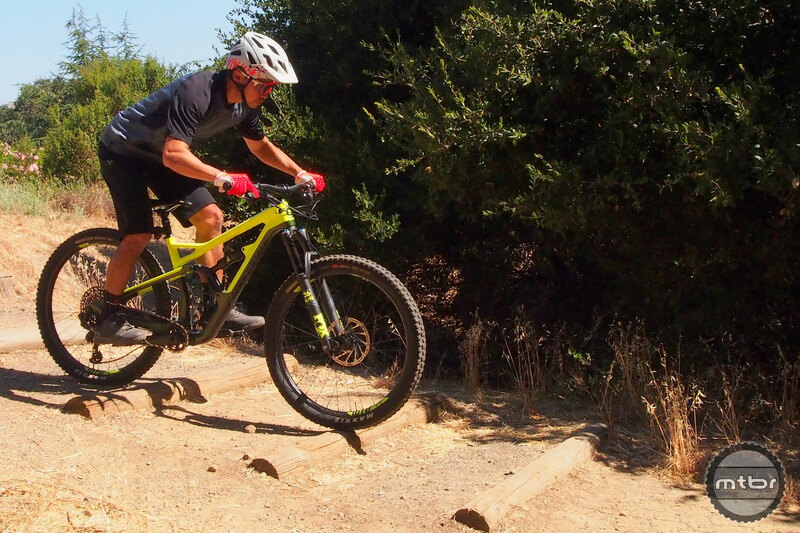 The only problem is we’ve been testing a few bikes now with the FloatX successor, the DPX2 and we consider that the best all-around rear shock on the market today. It has an amazing damping adjustment range, and the trail mode on the DPX2 is active and lively like this modified Cannondale FloatX. So we’d like to see the Jekyll with the DPX2 option in the future for a more remote lever free option. On descents, this bike is a champ. 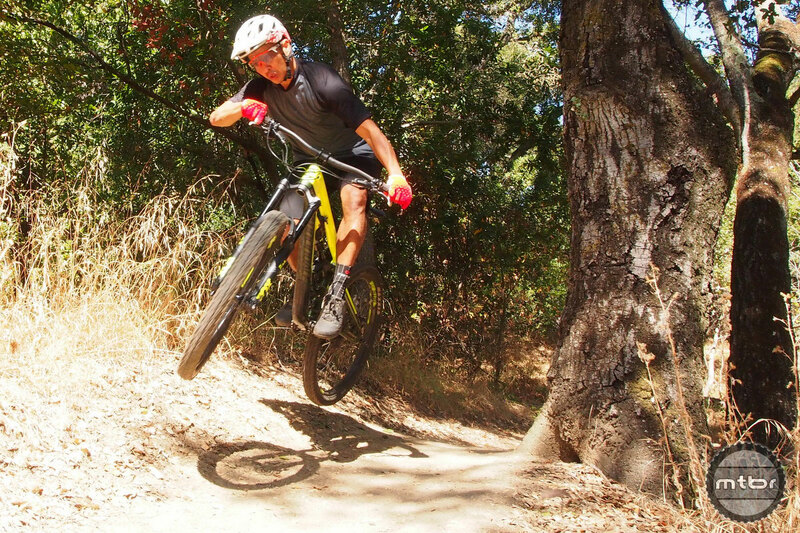 It rides like a lot of the best-in-class long travel 29ers we’ve been testing, but it is easier to throw around and dance with on the trail. Its strength is going fast on rocky, rooty riverbeds that throw the bike in all directions. The bike has the right suspension and geometry to handle this. The rear swingers have a bit of lateral flex because it is long and unsupported near the seat tube. 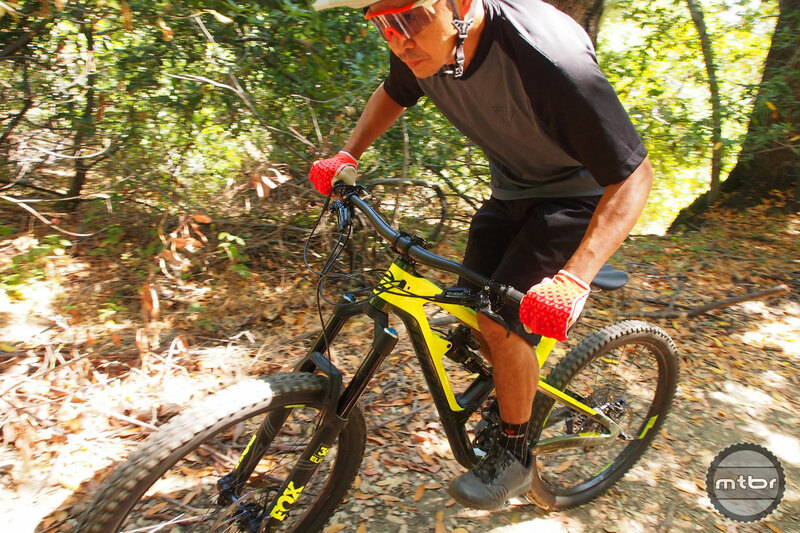 This allows the bike to flex a little and dance with the trail and not get bounced all over. At the same time, this little bit of rear lateral flex was not preferred by some of our test riders. Those that are used to a rear swing arm that doesn’t move may feel a little bit unsettled. When cornering sharply and changing direction, it has a somewhat vague feeling. But it’s just a little different feeling and riders can adjust to it and corner very quickly and descend with abandon. This bike is playful in the air and composed in most landing situations. This is the bike many have been waiting for Cannondale to build. Long known for their XC prowess, they have now arrived on the all-mountain scene with a true contender that has unique advantages. It’s the first Cannondale we’ve had where so many riders approached us to learn more. 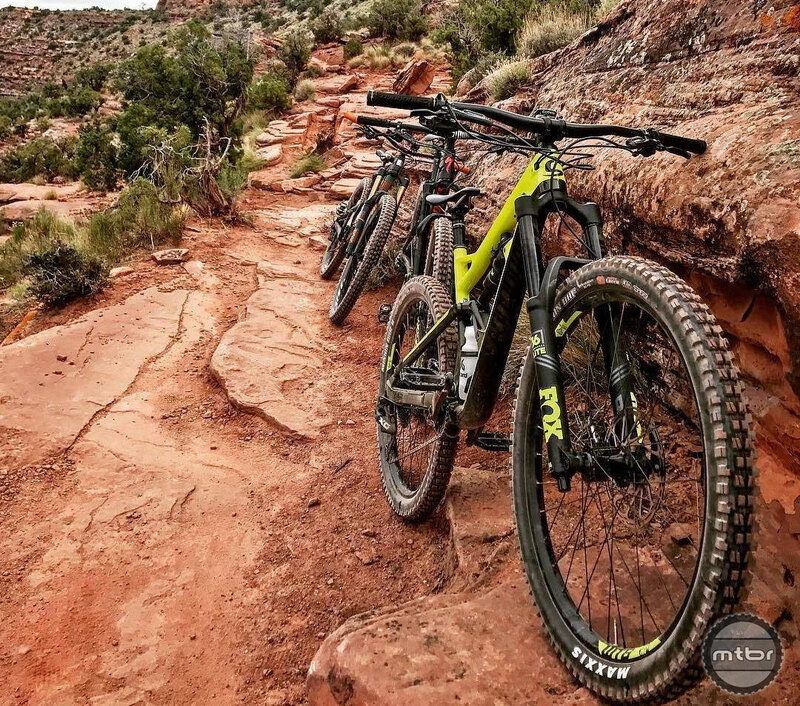 Editors Note: Cannondale has informed us that they made a running change to the bike and all new Jekylls with the FloatX are now being shipped with the Fox DPX2 instead. Bravo!!! 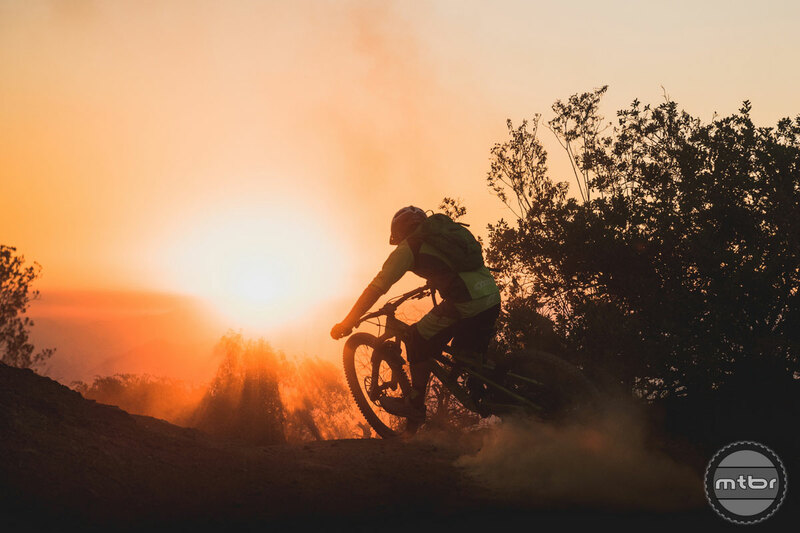 It’s the All Mountain bike we’ve been waiting for Cannondale to build. Fans admired the Jekyll’s full carbon downtube protector. Travel was just right for the rocky terrain. Riding was fun and easy down a big trail like Porcupine Rim. Flip to 130mm rear travel and climb. Took the Jekyll to Moab. Rocky gullies are in the Jekyll’s wheelhouse. Playful in the air landing and composed in most landing situations. It’s a bike that can take you on any adventure down and up. Clementz was key in designing the new Jekyll. Huge rear linkage makes kinematics possible while still leaving room for a water bottle. 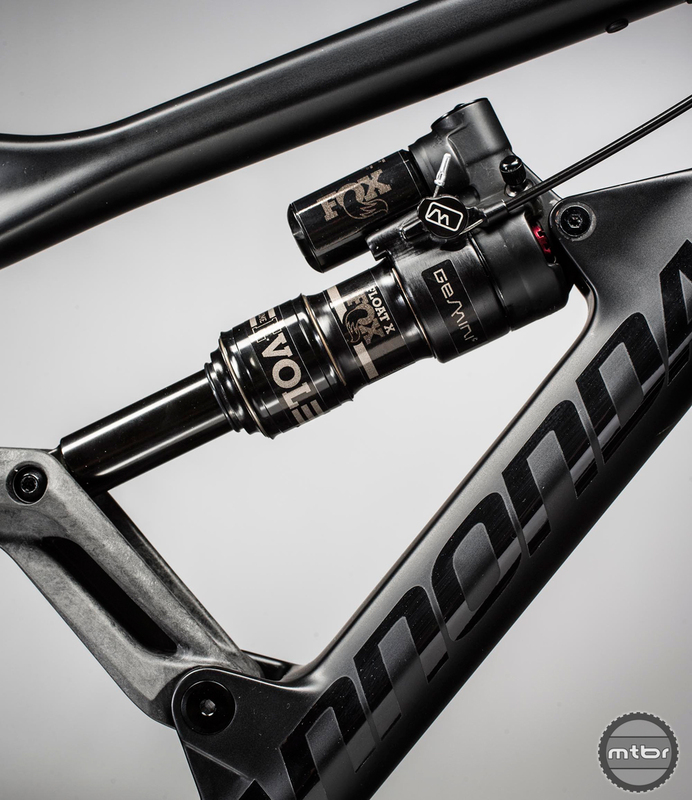 Special Float-X shock can be remotely switched between 130 and 165mm rear travel. Can anyone speak to the Editors Note about the running change from Float X EVOL to DPX2? 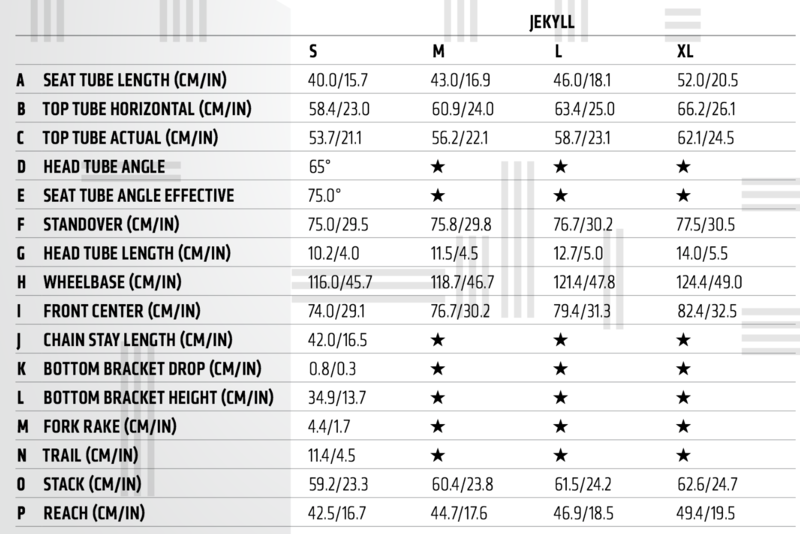 Cannondale website (as of 4/27/18) still shows Float X EVOL as spec. I read this review a while ago, but assumed it was just a mistake since no other reviews spoke of it and neither did any Cannondale info. However, today I was listening to an older MTBPodcast (Episode #46 from 2/22/18), and at 1:05:57 in the episode they say the same thing – that Cannondale “just switched over; they had a rolling change in production over to the new DPX2…” What gives? 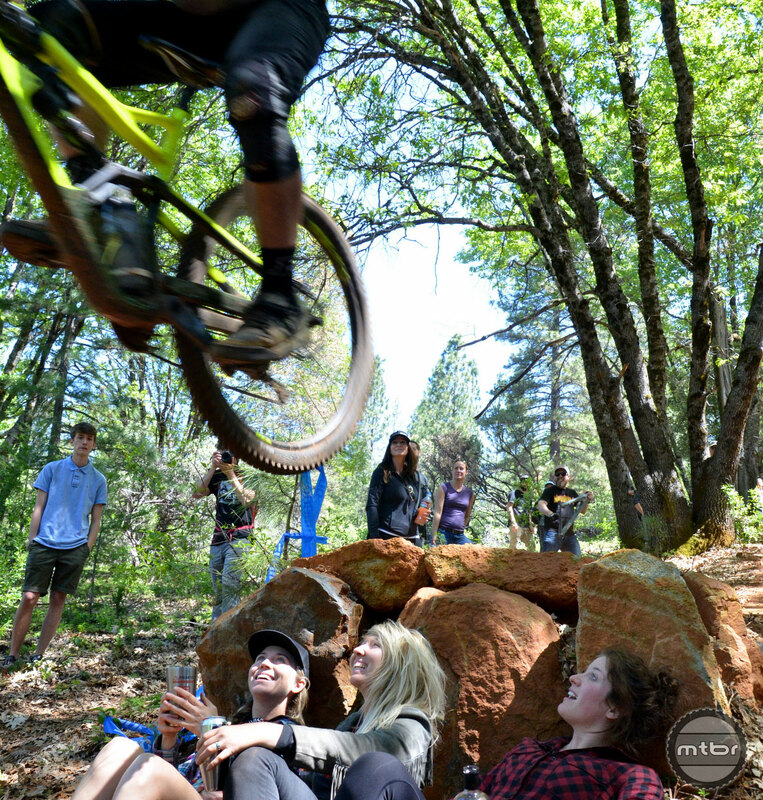 I got the official word from Cannondale on the Float X – DPX2 question I posted above. It is true. 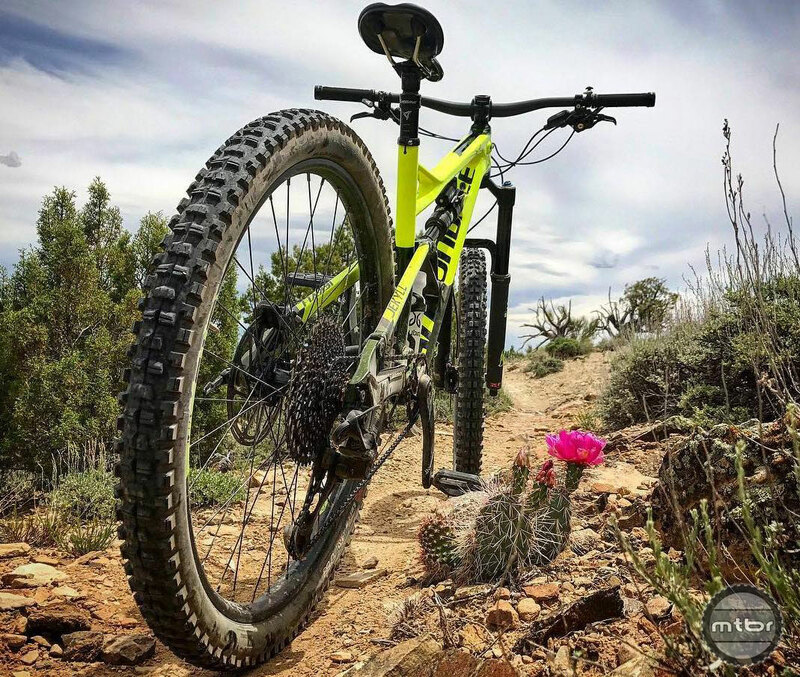 Cannondale is making a rolling change; however, the only way to guarantee a DPX2 is what arrives for you, is to wait for Model Year 2019 bikes.